Good morning everyone! Thanks to Amy Atlas for this lovely book which came in the mail yesterday! 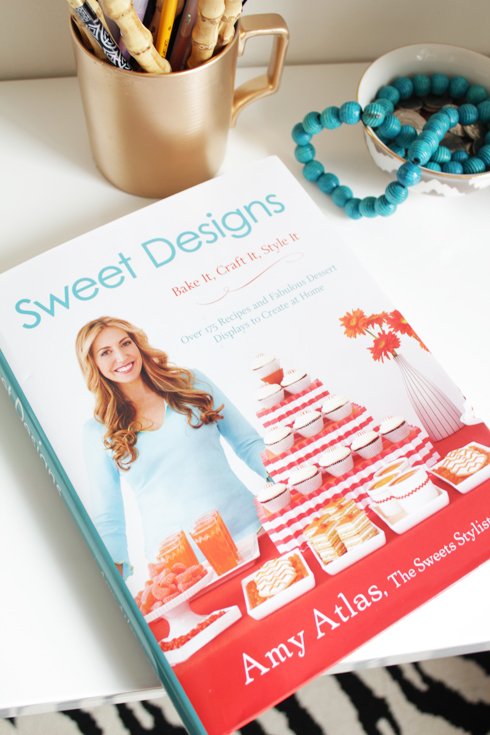 I'm so delighted to finally receive Sweet Designs after hearing so much about it! Amy Atlas is a former lawyer who is now a sweets stylist - creating all kinds of gorgeous dessert tables displayed to perfection! Her dessert tables are always so colorful & eye-popping which make her a favorite in the dessert styling world! The tables are ideal for weddings, special events, baby showers & more! No matter what party you plan, this girl can get it together! 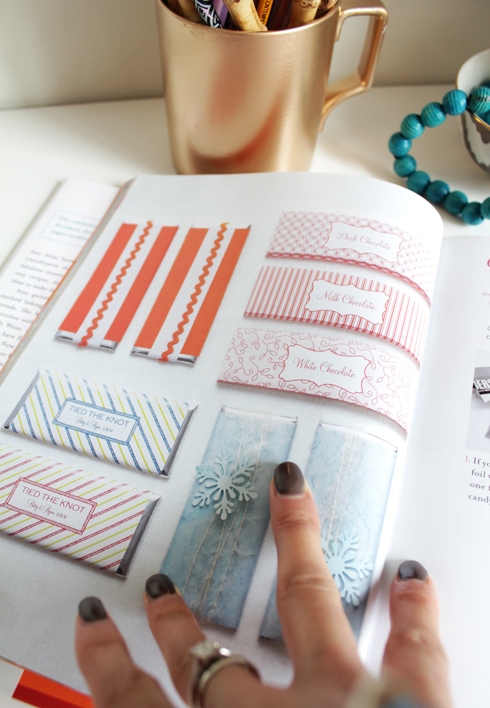 My favorite parts of the book are the 'custom candy bar wrappers' - fantastic idea.... which I'll be trying pretty soon! I also loved both the 'chipper chocolate cupcakes' & the 'chocolate beehive cupcakes' (all pictured below). Ahhh I'm such a sucker for sweets, if only my waistline wouldn't expand in the process! Get your copy of Amy's book here. Oh, I love the colourful cover and book pages. It's so cheery. Those candy bar wrappers are cute as a button. Love the tangerine one with zig-zaggy ribbon. So fun! I can't wait to get this book! I'm curious what your hubby thought about it since he's so awesome in the kitchen! Delicious! I'm not an avid baker, but my sister-in-law in bakery school would love this as a gift. Nice review. Brooke: Yea it will def make a great gift! Just love her style and how pretty everything is. 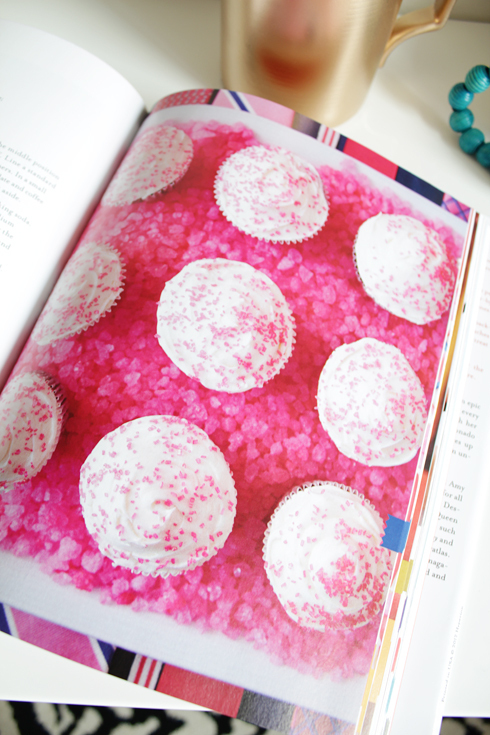 that page of pink sprinkly cupcakes is so yummy! 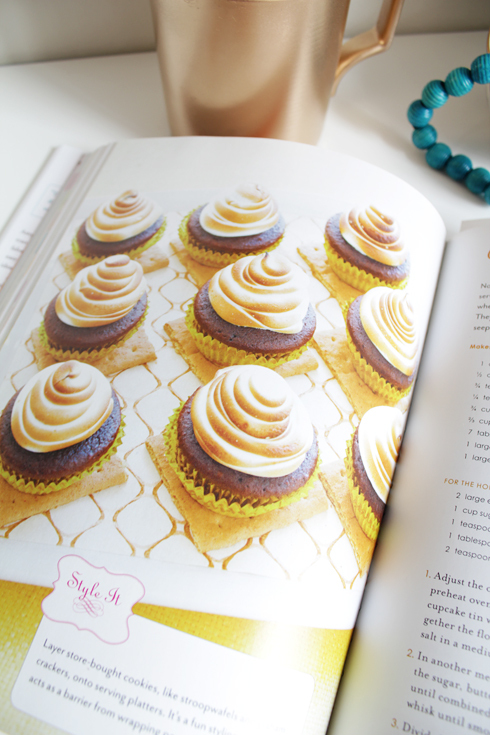 Wow, looks like a great book - you'll have to keep us posted as you make your way through it! Oh this is great! I have a friend who is actually doing desert tables as a side business, and she would love this. Thanks for sharing! haha the same with my man, I would love him to wear a stripe top and colour pants, but it is not his taste, and when buying clothes for him I have to resist getting him things I would love to wear myself or see him in, we love them anyway but a bit of trend would not make him bad isn't?